It was constructed in the 70’s and recently restored all rooms, it is set in an enchanting green valley, a few minutes away from the medieval historical center of Serravalle Pistoiese. 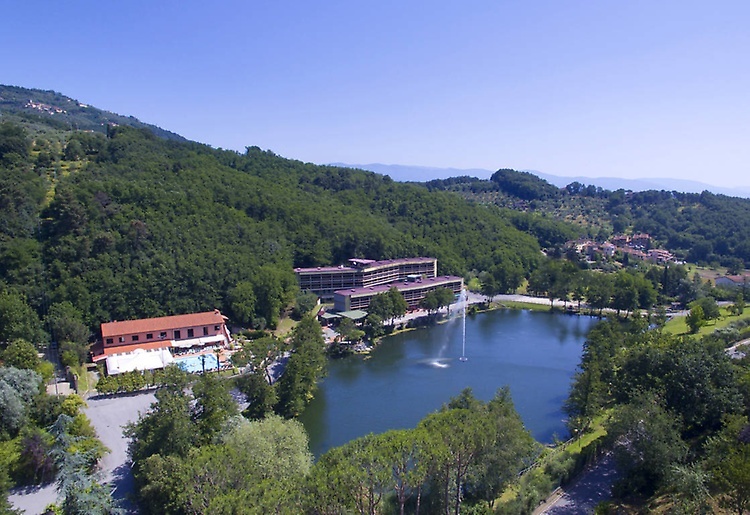 This hotel with a private lake is chosen by many tourists but also by businessmen for it’s proximity to Florence, Montecatini Terme and Pistoia. It’s formed by two parts of the building: one overlooking the lake and the other is behind it. There is also a newly built unit in a Tuscan rustic style that serves as a restaurant area and meeting rooms that can hold up to 150 places, with a great view on the swimming pool. Around the swimming pool there is also a veranda used for dinners or events. 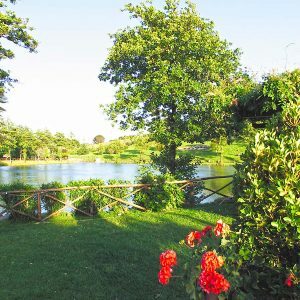 The lake and the tree and flower park confer to the hotel a romantic atmosphere, suitable for nuptial ceremonies and events. 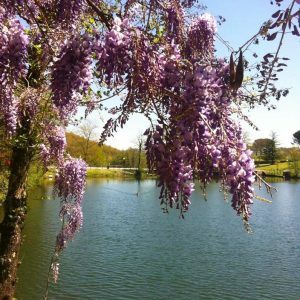 In front of the lake there is a small gazebo covered by wisteria and is the ideal place to capture in a photo the most special moments of the wedding. 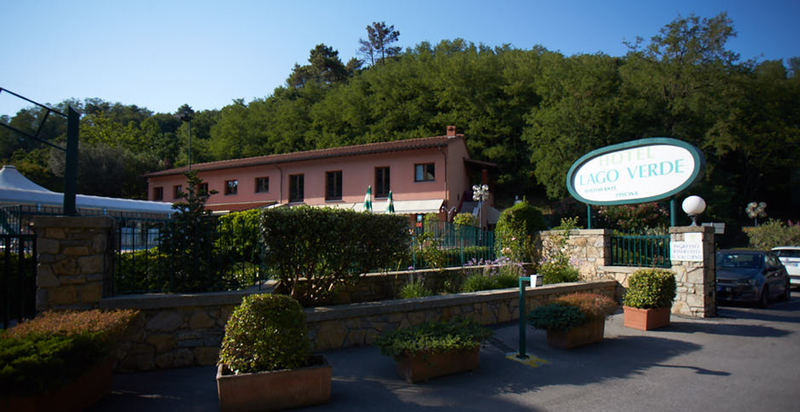 The nice restaurant rooms offer a local cuisine with products from the area of Pistoia. Small curiosity: in the lake it is possible, with the Aics card (issued by the hotel), to do regulated carp fishing. 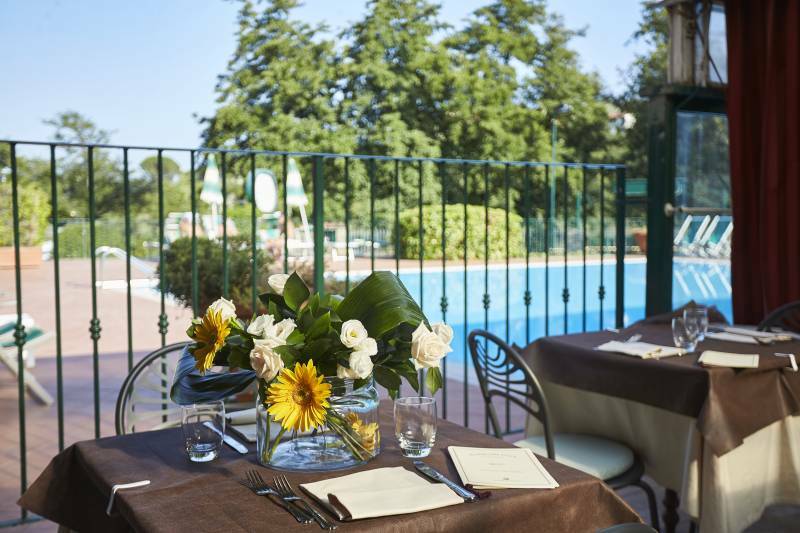 The main restaurant is the Barbarossa which can hold up to 150 people, but there are other airy rooms and the wide veranda on the side of the swimming pool that are located in the hotel. The charming Red Rose hall in a Tuscan rustic style can hold up to 150 people per stall area.Equipped with screen and modern facilities. Smaller meeting rooms. The location is idea for weddings and all type of ceremonies. Private lake and dining rooms with swimming-pool view. Nice swimming pool with furnished side pool area, it is the ideal place to sun bathe or sip a drink in complete privacy. The private lake offers picturesque views, especially during sun-set. Lake fauna and flora. Path along the lake side. Regulated carp fishing, with Aics card. ”I was visiting a factory in the area and I stayed in Lago Verde for a night. It is located by a lake over Looking a small village and some hills. It should be awesome in spring. The staff were friendly and polite. The only downside was the breakfast buffet. It was very small and not as expected. I loved the hotel and recommend it. ”For the third time we spent the holidays at this Hotel. The staff is really magnificent. Despite being a VERY frequented hotel, the customer is welcomed as if he were in the family. The restaurant is, as usual, great !!! The chef, Paolo, prepares really good food, NOT minimalist at Nouvelle Cuisine. The pool is a paradise, after the various excursions around (this year we went to Vinci, Prato, Florence, Montecatini Terme) We will, of course, come back next year. ”We needed an accommodation for the night, having a concert at Pistoia Blues the same. We booked at this property. Upon arrival we parked in the parking lot and the receptionist nice and helpful welcomed us very well, providing us with various information to facilitate our trip to the nearby Pistoia. The room is not huge but comfortable with a large patio door overlooking the lake as reported on the site. Suggestive. On our return the very nice Mr. Ilario has entertained us for a while ', taking interest and documenting later on our evening and the concert and consequently on the group. He also recommended the excellent pub located a few meters from the structure in which we ended the evening. 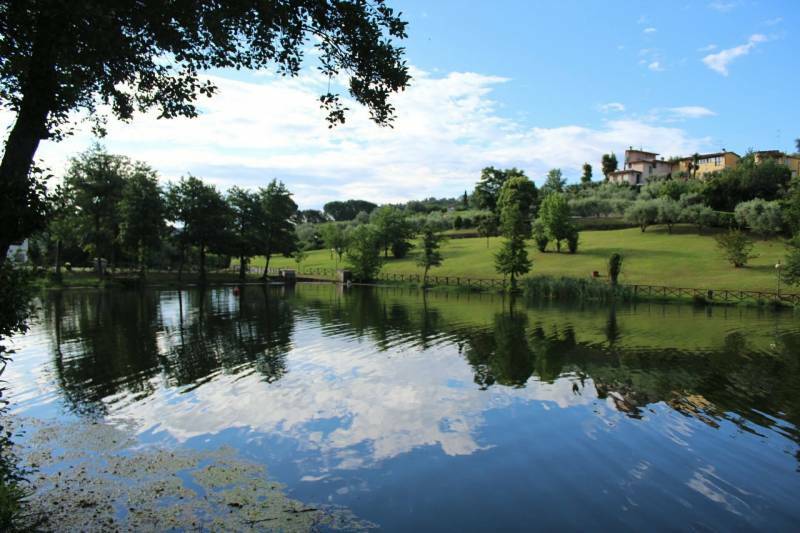 In the evening, the view and the tranquility really create a suggestive oasis among the Pistoia hills. Very good indeed, to come back, I highly recommend it.